Sports-related mouth injuries are the most common cause for more than 5 million teeth are avulsed, displaced from their socket, each year. Nearly 80 percent of all dental injuries affect at least one of the front teeth, while damage to the tongue or cheek is common. According to the CDC, sports-related dental injuries account for more than 600,000 emergency room visits each year. This results in nearly $500 million spent on replacing these teeth each year. A custom fit mouth guard is absolutely essential to your child’s safety while playing sports. Consider a sports guard just part of the uniform. If you are not sure if your child’s sport has a high incidence of mouth related sports injuries, consider all of the opportunities for injury during practice, games and competitions. Some kids are more accident prone than others and can find a way to get injured in any situation. Organized sports that have the most oral injuries include basketball, wrestling, field hockey, ice hockey, football, soccer, lacrosse, baseball, and softball. Unorganized or pickup sports such as biking, skating, and skateboarding are the recreational sports that have the highest chances of injury. Keeping a sports guard clean is essential in the proper maintenance of the device as well as keeping the mouth clean when wearing the device. If your child is just throwing their mouth guard in their dirty gym bag and then back in the mouth, that is another chance for dental issues. The build-up and bacteria that can grow on a mouthguard is well documented. Protect your investment with Prodentclean! There are many different types of night guards on the market from over the counter to custom made ones to fit your mouth exactly. Dentists recommend a custom night guard because the over the counter guards can cause issues if they don’t fit properly from issues with talking to breathing. Most consumers are fitted with a custom guard by their dentist that they wear at night. Night guards can be prescribed by a dentist for various reasons from bruxism which is usually referred to as teeth grinding or teeth clenching. The mouth guard helps with the grinding by providing a smooth area for the teeth to slide instead of rub. TMJ is another common issue that may require a night guard. The night guard can help by alleviating pressure on the jaw and reduce stress. Application of oral pastes or gels is another option for a night guard. Whether it is a paste medication that needs to be kept in place on the teeth or gums or teeth whitening gel, a night guard provides that necessary device for holding the paste in place. So with the importance of a custom fitted oral night guard comes the importance of keeping the night guard clean and free of build-up debris and even harmful bacteria. Some people try to clean their night guard with everyday household items on hand such as toothpaste, vinegar, baking soda etc. The problem with this is that the night guard is actually porous and will begin to wear and tear and turn yellow without the proper care. If you have any investment in your night guard then keeping it clean, free of build-up and well maintained for long-term use should be important to you. What good is a night guard that you paid for to help with grinding your teeth if it is loaded with grungy build-up and harmful bacteria which can lead to bad breath and cavities and even health issues? It may be causing you more harm than good. Anything that enters your mouth will eventually have access to your saliva and be ingested. Make sure that your mouth guard is cleaned after every single use. Let me repeat that. Clean your night guard after every single use. You probably throw away your toothbrush every month or 2 but you don’t do that with a night guard. You keep it for years sometimes 10 years or longer. What if you had to keep your toothbrush for 10 years? The need to clean your night guard is the exact reason, Dentist and Sleep Medicine Expert, Dr. Todd Morgan developed Prodentclean. He saw his patients come in with unsightly and smelly mouth guards and have his dental staff clean them with harsh chemicals that required gloves and he knew that patients needed a natural and effective way to clean their guards at home. Prodentclean is different than other mouth guard cleaners on the market because it is natural, safe and it is as effective as the harsh chemicals that many dental offices use. Prodentclean works great on night guards with a simple soak or spray and then rinse and wear. Since the natural ingredient is the Empowered Oxygen formula you don’t have to worry about burning the skin or ingesting anything dangerous. Empowered oxygen also removed build-up and whitens most oral appliances. Try Prodentclean and keep your night guard crystal clean and well maintained for years to come. Dentures are a hefty investment. Keeping them clean is not just good for oral hygiene and overall health but it is also important to protect your investment. Improper care of dentures and partials can cause damage as well growth of harmful bacteria and organisms. Dentures and partials are porous despite looking solid. If you took a microscope to your dentures then you would see the pores. A simple toothbrush may not be enough in getting to the hiding spaces. Bacteria likes to live and multiply and will find ways to do so. The bacteria that continues to live on dentures and partials causes bad odors and bad breath. It’s important to clean dentures and partials properly with a grunge removing ingredients like Prodentclean in order to keep the problem from occurring or getting worse. Research has shown that older patients have a higher count of bacteria and germs in their mouths. This is yet another concern that should be kept in mind. Did you know that the average full-mouth denture in the United States is 17.6 years old? That could be years of collection of germs and bacteria. Thorough daily cleaning with Prodenclean and routine professional follow-up can prolong the life and comfort of dentures and partials. The denture wearer experiences greater confidence, satisfaction, and pleasure, and produces more smiles and a healthier, happier life with dentures. Order Prodentclean today and protect your investment! Grungy buildup on an orthodontic retainer is very common. That buildup over time can cause discoloration, bad odors and even harmful bacteria. These are reasons to clean your retainer on a regular basis. Many retainer cleaners contain harsh chemicals that can start to cause wear and tear on your very important, very expensive investment. So what’s a patient to do? Prodentclean cleans your retainer with natural empowered oxygen as well as other naturally occurring ingredients. Imagine, spraying or soaking your retainer for a few minutes and watching it begin to foam up while the grungy buildup begins to dissolve away. That’s how easy it is to clean your retainer with Prodentclean. Below are instructions with a spray top and a pour top. Order Prodentclean today and see how easy it is to keep your retainer clean with our safe Prodentclean cleansing rinse. Place appliance in a container, add enough Prodentclean to cover appliance, then add equal parts water. Let device sit for 15 minutes, agitate or brush then rinse with water. Your device is ready to use. Rinse device thoroughly in water. Spray generously with Prodentclean. Set aside for 10-15 minutes. Rinse with water. Your device is ready to use. You go to the dentist expecting to get a cleaning and hopefully a good report with no cavities. But your dentist can see more than just your dental health, as some serious health conditions can first be spotted during an oral exam. For example, worn down teeth can mean that you are grinding your teeth at night. In this case, sustained jaw clenching at night while sleeping might mean that you will be prescribed a custom fitted night guard to protect your teeth and jaw. Research in the International Journal of Oral Science in 2014 reported that sustained jaw clenching (another characteristic of bruxism, or teeth grinding) can lead to severe damage of the tissue in the joint that connects your jaw to the rest of your skull. If you are prescribed a night guard, then the added responsibility of keeping it clean will be added to your dental routine. In which case, a natural product like Prodentclean will be essential. Additional symptoms that could signal additional medical referrals include persistent bleeding gums or bad breath, white patches inside your cheeks and mouth, inflamed gums, and extremely dry mouth. Each of these symptoms could mean something more is going on and is worth checking out with a primary care physician or specialist. Learn more about dental symptoms and what health related issues could be going on. This month-long national health observance brings together thousands of dedicated dental professionals, healthcare providers, and educators to promote the benefits of good oral health to children, their caregivers, teachers and many others. Since Orthodontics are such a big part of many children’s lives and that usually involves an orthodontic retainer or sports guard at some point, we are encouraging the use of Prodentclean to keep all orthodontic devices clean. These devices can harbor some pretty nasty buildup if not properly cared for. Have you ever tried smelling a grungy mouth guard? If not, don’t start now. As you can imagine, that build up is not going to lend itself to a healthy dental environment. So this month is the perfect time to try Prodentclean and show your child how to simply spray the mouth guard with our solution then rinse and it’s ready to go. Study shows mouth guards harbor large numbers of bacteria. According to a study that appears in the September/October 2007 issue of General Dentistry, mouthguards harbor large numbers of bacteria, yeasts and molds that can possibly lead to life and/or health-threatening infectious/inflammatory diseases. We recommend that you protect your mouth guard, sports guard and orthodontic device with Prodentclean. A custom mouth guard is a large investment that should last for many years. Avoid build up and staining by keeping in clean from food and other accumulations from the mouth. 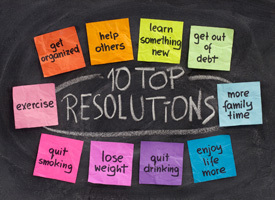 Are you a new year’s resolution type of person? Fresh starts are healthy and a great way to focus on becoming our best. Being healthier and looking our best is usually at the top of most people’s resolutions list. A beautiful smile should be part of that. To have a beautiful smile, you must start with a healthy mouth. Here are some tips to help you ring in the new year with a healthy mouth. Did you know that you should replace your toothbrush every three to four months? Bristles that become frayed and worn are less effective at cleaning your teeth. That means, celebrating the new year with a brand new toothbrush is actually smart dental hygiene. You can also maintain your toothbrushes with Prodentclean to keep them free of bacteria causing buildup often times invisible to the naked eye. Brush longer. Always brush twice a day for two minutes for healthier teeth, good breath, fewer cavities, and to avoid painful dental problems. Clean toothbrushes with Prodentclean. Floss. Flossing is part of being mouth healthy. Wear your mouth guards as prescribed. Clean them nightly with Prodentclean. Visit dentists every 6 months. Visit Orthodontist as recommended. Clean retainers and orthodontist devices with Prodentclean. Eat a healthy diet. Eat a balanced diet and limit between-meal snacks. Drink water often and rinse away staining beverages such as coffee and color drinks. Holiday travel can be hectic but is also the perfect time to kick back and forget about your responsibilities. If you are planning on travelling or have a change in your routine this holiday season, be sure not to let your dental health fall by the wayside. If you or a family member uses a retainer, dentures, partials, invisible orthodontic aligners or even your everyday toothbrush, you should be cleaning these product regularly to maintain them and keep away the grunge the begins to buildup. Sometimes that buildup is not visible to the naked eye. Keep dental supplies handy when travelling. Keep floss, a toothbrush and a tube of toothpaste and a travel size bottle of Prodentclean in a travel size bag ready to go with you on roadtrips, overnight trips or on world travel. They’ll be easily accessible when you want to clean your teeth and dental products. Prodentclean is committed to offering an easy to use and safe way to clean oral devices and dental products. We now offer our customers an option to purchase prodentclean with a spay bottle top.